In the eyes of Terrance Hayes, language is a feisty animal, and he is just a student who wrestles with it. 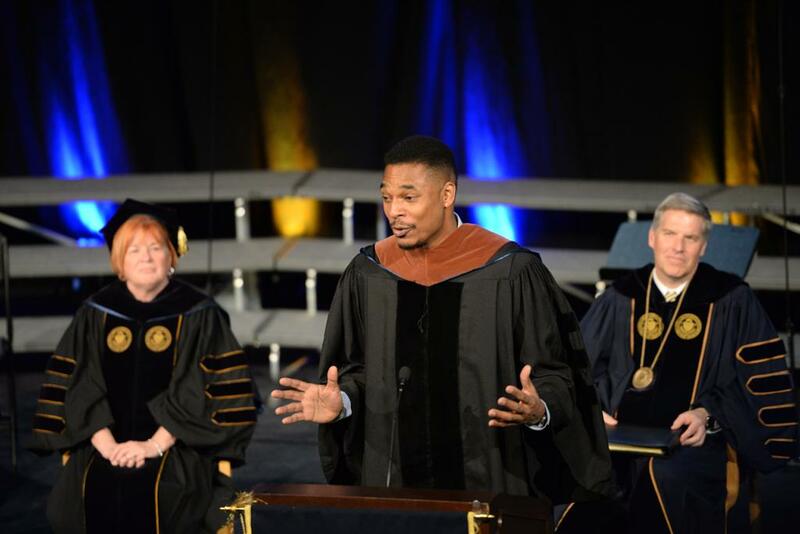 In honor of Hayes’ success in taming that beast, Chancellor Patrick Gallagher awarded the poet and Pitt professorwith an honorary doctorate of fine arts at this year’s Honors Convocation. Provost Patricia Beeson and Vice Provost and Dean of Students Kenyon Bonner recognized successful undergraduate honors students 3 p.m. Friday in the Carnegie Music Hall. Hayes’ acceptance speech also served as the keynote speech for the annual convocation. Before Hayes’ speech, Gallagher praised the South Carolina native and his exemplary literary career. “Hayes is the only modern poet that I know of that has written a sobering poem about race that echoes the dialogues of Dr. Seuss and a series of poems packaged within a police crime report,” Gallagher said. Hayes, who earned a master of fine arts degree in poetry from Pitt in 1997, won a National Book Award in 2010 and recieved the MacArthur Fellowship — commonly known as the Genius Grant — in 2014. He’s published five poetry collections including his most recent work, “How to Be Drawn,” and his work has appeared in The New Yorker and The American Poetry Review, among other publications. After teaching at Xavier University of Louisiana and Carnegie Mellon University, Hayes began teaching poetry and creative writing at Pitt in the fall of 2013. When Gallagher presented him with the honorary degree, Hayes responded humbly, saying that despite the doctorate, he’s still learning. Hayes meditated on the power of language and the impossibility of perfecting or mastering it in his speech. Beeson and Bonner presented awards to seniors Emily Crabb and Eleanora Kaloyeropoulou after Hayes’ keynote speech. Crabb received the Locke Award, an annual award for graduating seniors established in 1946, for her high scholarship, character and devotion to Pitt’s ideals. She said she plans on pursuing a graduate degree in physics and has already been accepted to a number of schools including Michigan Institute of Technology, Harvard University, Stanford University and Cornell University. Kaloyeropoulou, a history major, received the Omicron Delta Kappa Senior of the Year Award for her leadership during her time at Pitt. Each year, the honors college awards one graduating senior who exhibits leadership. Kaloyeropoulou is the president of Omicron Delta Kappa, a national leadership honors society, and formerly served as president of Campus Women’s Organization and Plant to Plate: Pitt’s Urban Garden. She said that receiving the award was a tremendous honor, and she intends to continue her leadership through law school and a career in politics. Each introductory speaker focused on Pitt’s Year of the Humanities, which Hayes’ award exemplifies. The poet said the true honor lies not in his poetry but in language itself.